It isn’t often that a Uni Watch post is almost exactly one year in the making. It’s also not often that Paul pumps out an ESPN Playbook piece that is about 90% of what I had planned for the weekend. Today is the even rarer confluence when both events occur. Lets tackle the first bit first — exactly one year ago today, because St. Patrick’s Day fell on a Saturday — I had written up this article about the wearing of green, St. Paddy’s day-themed jerseys by sports leagues. Shortly after writing that, Uni Watch Buc Tracker Jerry Wolper approached me about a look at baseball’s St. Patrick day jerseys for 2013. That was about 363 days ago. I had almost forgotten about it but I bookmarked it and remembered a little while later. Jerry had already done a good amount of research and I asked him if he still wanted to go with it for today. He had forgotten, but said “yes” after my reminder. So that’s that. Is wearing green on March 17 an idea that’s outlived its usefulness? Maybe. But this is the 35th anniversary of the green gear, and attention should be paid. Would it have killed the Reds to mark the anniversary with a commemorative patch? Maybe they’ll do that in another five years — if teams are still wearing green by then. If you want a more thorough history of the beginnings of the fad, I point you to this excellent article by MLB’s Tom Singer. Definitely worth the read. Maybe AP will have more; I’ve looked at enough. Also, many minor league hockey teams like to wear green for St. Patrick’s Day. Teebz may be able to get you started there. With the help of Bill Henderson’s guide, I’ve put together a brief historic introduction to St. Patrick’s Day jerseys. Today is St. Patrick’s Day. In addition to parades and green beer, it means that baseball teams will wear green. Some will wear caps, some jerseys, and some will wear both. jerseys were more common, although the 1988 Twins wore white with green trim. Now, green versions of the regular BP jerseys are very common, as we’ve seen in the last five years. Thanks, Jerry! Of course, that probably isn’t all of the jerseys (and certainly not the most recent ones), but they’ve even celebrated the day up in Canada down in Florida, with the Blue Jays participating. Great stuff. So, has the gimmick run its course? Or is this a fun little-almost-end-of-spring break for the players soon to break camp? Somewhere in between? Be sure to watch your favorite team(s) today and see if they end up wearin’ o’ the green. As fate (and the date) would have it, I was contacted by our friend and UW reader, Shannon Shark, who runs the nifty web site, “Mets Police” (link to follow), who wanted to give a little rundown of the Mets (and his ‘favorite’ player, #ImWith28 Daniel Murphy) and their wearin’ o’ the green. Last year my cousin and I bought two team issued unworn St. Patrick’s Day blanks and had them customized with Murphy 28 and the Kid 8 patch. We assumed there were only three of these in the world (the third being the one Murphy himself worn) and I mentioned that on Friday when I posted my “Green Murph” on Mets Police. That brought Nick out of the woodwork who sent me his customization (including the Kid 8 – nice job!) and then that got Ron to email me pics of what he says is the actual 2012 Murphy. The Mets tweeted the 2013 green yesterday, seems to be same as the 2012, and that too was a Murph. I guess there are now five in the world, four of which have the Kid 8 patch. I wonder if any Uni Watch readers have their own Green Murph. We could start a club. Thanks, Shannon. And here’s the link to all the Mets St. Patrick’s Day designs over the years. Great history of the Mets and their wearin’ o’ the green. 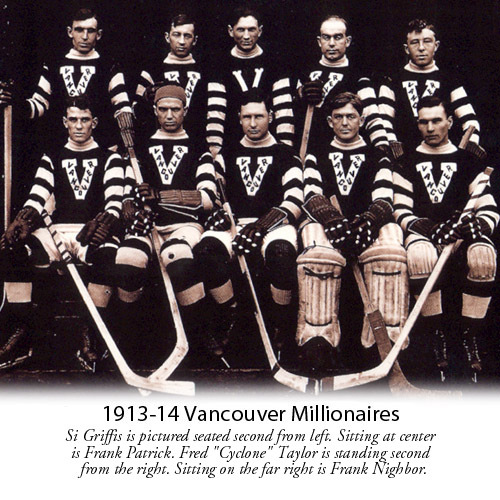 So, last evening, the Vancouver Canucks broke out their awesome Vancouver Millionaires throwbacks. Very interesting to see modern-day players wearing white breezers. Of course, it helped immensely to have the Canucks playing against the Red Wings, since this made for a sartorially pleasing match up. I didn’t see any of the game, unfortunately, so I’m just going off photos, but it looked great. I really, I mean REALLY, love love love the “V” with VANCOUVER spelled out as a crest. I mean, that is one sharp logo if I do say so, myself. Unfortunately for the home team, they fell to the Wings. You can read about the game and see lots of game photos here. So, how’d the throwbacks do? Well, if this photo is any indication, pretty good. If you want to know more, I point you to a very in-depth article by SBNation. Great read and highly recommended. Well readers, how’d they do? Faithful reader of your blog and Cleveland, OH designer/illustrator Aaron Sechrist, owner of Okpants Design Co.
I’m friends of Vince Grzegorek and had the pleasure of meeting Paul in Cleveland last year. I’m reaching out to you on his urging. The recent Jaguars logo re-design has prompted me take to finally take to the art board to get my point of view across rather that rattle out nit-picky tweets and bore my wife and friends with discussion on it. Attached is my “If it were mine” take on the Jags new logo. The execution of the new logo didn’t bother me (which I think is fine), it was the lateral creative direction overall that confused me and the “change for change’s sake” feel to the project. After 17 years, the old logo hadn’t yet worn thin on me, Chee-to Puff spots and all. With that said, I thought it was a good opportunity to really shake the look up and not simply update the original concept while maintaining core elements of the original team branding. Some goals included rendering the spots in a uniform and slick manner, and also to work detail into the look while trying to keep the whole logo restrained, consistent and simple aesthetically. At any rate, attached is what I worked up. if you deem it blog-worthy or even to take a look at it, I appreciate it. I can tell you it’s brought more Jaguar fans of varying passionate opinions out of the woodwork than I knew existed. Thanks for your time and looking forward to more uni/logo stuff from you! I tweaked the Sonics brand (once they are back in town) with a new generation look and feel. I blended their throwback/most recent look with the chest panel continuing to the side of the jersey and down to the shorts. I also added the top of the space needle to the back of the name plate. With the Mariners, Seahawks and Sounders essentially using the same color pallet I figured why not incorporate a look associated with Seattle into the Supersonics branding? A quick note on the WBC post from yesterday. I may have come off a bit harsh on the uniforms, but I hate the side panels and yokes on baseball jerseys. But about the games themselves — I complained about the lack of interest in the USA (or at least that’s my take), and the thought that now is not the time to be playing them. It’s spring, and to get the games in, you’re interrupting the spring training regimens of almost every team, including some of those for foreign nations, and it seems to me the games aren’t being taken seriously. Also, with injuries and pitchers on counts (and short leashes), you’re not really seeing the *best* of what the world has to offer. Stop the MLB season for two weeks in the middle of the summer (like hockey does during its season for the Winter Olympics). You’d have (in theory) healthier players in shape, and pitchers who could go much deeper into games. Begin the season MLB one week earlier, and add one week at the end (or, scrap one round of playoffs — yeah right). Play the games only once every four years (like they do now) and add incentives for the players — put it on broadcast television and split the revenue and the merch sales amongst the owners, and let each city in North America host at least one game — with the owners keeping the full gate (which should grease the wheels a bit). Split the rest evenly. Make it a “must see” event and I bet it would do well. People love the World Cup and the Olympics, and this could become one of those type of celebrations. It just might work. Unlike Olympic Baseball (which is no more anyway), where the big league clubs wouldn’t let their players participate, this could be done in conjunction with and with the blessing of MLB and other leagues. It just might work. No, it’s not perfect and it probably would never go down this way, but that’s my suggestion. Feel free to tell me I’m way off. Phew. And that folks, is a wrap for this fine St. Patrick’s Day. Everyone have a great one. Thanks for posting early! I’m an early riser and really appreciate not having to wait until 7 to get my fix. Also, I totally agree on the side panels and yokes and would add the waving stripes as the “s” in the USA is my least favorite part of that uniform. The South African cricket team usually wears green in their one day matches. Today they’re in pink for breast cancer awareness. My favorite part of the “One for the Road” pic is Roberto Luongo’s mask with the “V” logo wrapped around the chin. Let’s just recognize the World Baseball Classic for what it is — another money-grab scheme by Bud Selig. Let’s not pretend that the WBC is about trying to come up with baseball’s answer to the World Cup or any other altruistic motive. This is about MLB trying to squeeze out more money in merchandising and ticket sales. I guess I’m small-minded, but I just care about my team and MLB. There is better baseball played in other parts of the world, and I’m fine with that. I don’t care about international competition. I care about whether my MLB team will make the playoffs (or better yet, not lose 100 games this season). Why is George Chilvers communicating in that odd dialect? Slainte, George! Though I’m swathed in a green ratty sweatshirt in honor of the homeland, I’m with Paul on the enough-already reaction to green unis on 17 March. It’s as if we Irish have morphed into cute lil everybody’s favorite ethnic group. We’re mean self-loathing dismal SOBs, and I’ll flatten the man who says we’re not. Just because Joyce described Ireland as “the old sow that eats her farrow” doesn’t require you to live up to it. I like the Jaguars concept. The trim around the shield could be done differently, but generally, a nice job. As for the SuperSonics concept…it’s useful only to show that it doesn’t work in anything except green and gold. So all those baseball fans who can choose from 100 or more games every day, whether major or minor league, would pretty much only have the option of watching some WBC games on their TV sets for two weeks in the middle of the summer? And for what purpose, exactly? So someone in Barcelona or Paris might one day like the sport? I think the WBC is fine for what it is right now, and any effors to disrupt the regular season will only piss off millions of fans. Ah, erudition, DJ! Take a joke fer crissake. I find humorous that on this day, with all this talk about green, two teams whose color schemes involve green – the Sonics and Canucks – are devoid of it. Ok, so maybe it’s not that funny..
Take a look at the Sonics concept again. Tis not totally devoid of green. And the “Millionaires” played on 3/16. d’oh! That’s what I get for looking at the image on my phone. I stand corrected. Had the unfortunate luck of watching that “Millionaires” game last night. But they looked good losing. Cheers. 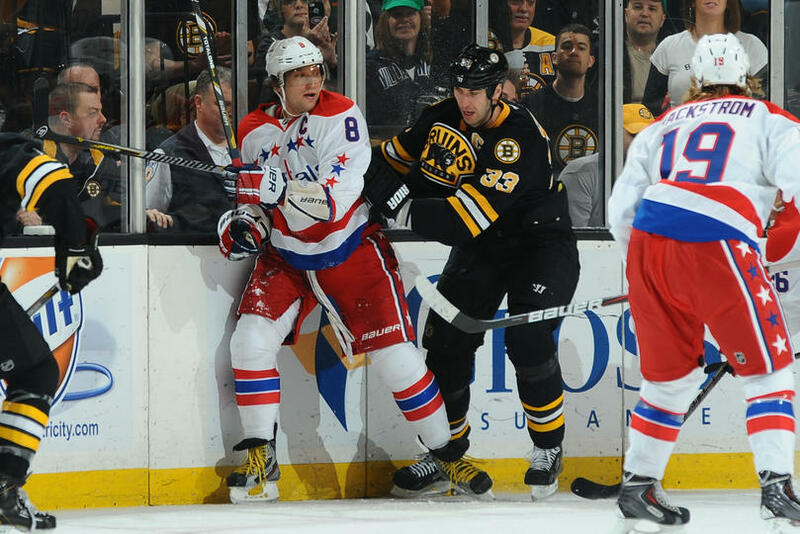 Boston and Washington pulled off the rare alternate v. alternate game. Rare because most alternates are reserved for home games, while Washington does the exact opposite. This is because Ted Leonsis (owner) is cognizant of jersey prices in a tough-ish economy, so his word is good that the Capitals will always wear their standard reds at home. This way, if you can only have one jersey, and you want to match what the players are wearing, there is no mystery at home. I like the idea of playing during the allstar break. It would only be every four years. And it would not kill the teams and union to occasionally play doubleheaders to make up some of the days lost. Of course, i also think they should play some games abroad. Who are the two time defending champs, after all? I say, get rid of the “winner of the ASG gets home field for the WS” rule, and have the WBC replace the ASG every 4 years. Yeah, they do look similar to a concept some dude sent in a while back. No offense to that tweaker, but I like Ryan’s pants’ stripe treatment much better. Thats funny because ive been messing with the pant stripes recently and he did basically what i was looking to accomplish. I find myself almost approving of the blur top/gold pants combo. Well done with the pants! I was going to say the same thing, Coleman. Did you see that your concepts were the basis of a thread on the Scout WVU message board? I like the blue sleeves on the white jersey, but wish it didn’t extend down the sides. Also, the pants stripes are a little busy on all but the blue pants. All that said, I really like this set, and would take it over their current unis in a heartbeat. Yeah man. I got the email, thanks for the heads up. I just havent made time to sign up and inform them of the look i was going for. Maybe ill get to it before next season. Heh. Id take these over the current set too. No doubt. As big of a baseball fan I am, I haven’t watched one game. I really don’t get into it because it’s spring training and I’d rather see my favorite team warming up for this sesaon’s slate than be put into a competition where they could get hurt. Putting the WBC into the season (a la the Winter Olympic hockey delays the NHL season) is problematic because, as we have seen with the Tigers after sweeping the Yankees last fall, when teams take a week off it throws them off. It could make for bad baseball and some teams falling out of the playoff hunt because it took them longer to recover than the other teams in the league. Putting it after the season kills it because it goes up against the super popular NFL and college football (and later in the fall pits them against those two plus the NBA and college hoops). They only solution I could go with is to, like the Olympic competition, go with minor leaguers and college kids and hold it during the season after the College World Series has ended. Some of the college stadiums could be used with the finals at one of ballparks when the home team is on a road trip. An impressive part of the Vancouver throwbacks is that they included the pucks. As that closing photo of the goalie making a save shows, they used the throwback logo on the pucks for the game – a little detail that would only be noticed, during the game, by on-ice personnel and the rare person who gets a puck in the stands. I’d have thought they’d have shown them on the TV broadcast. Little feature at intermission or in/out tv timeout. Aaron, I curious why the border on the shield shape containing the jaguar is done with the two different colors (black and gold)? I’m not put off by it, but I am very curious why you made that choice to only break the logo’s symmetry there? Fair question Daniel. While I generally don’t like excessive use of stroke & beveling in sports branding, I did want to imply some kind of dimension and detail in an otherwise simple containing shape in a simple an clean manner. Thanks for taking a look! Not sure if I heard correctly (no DVR, so no way to review), but I’m pretty sure I heard Greg Gumbel call Marquette the Warriors on one occasion on CBS’ selection show broadcast. They haven’t used that nickname in nearly 20 years! Yep, I heard the same thing, Greg referring to Marquette as the Warriors. Shawn Kemp has been out of the Association for a decade now and hasn’t played for Seattle since 1997, can we stop putting his name on the back of potential Sonics’ jerseys? I think it seems like maybe you don’t like the WBC, and maybe the American players don’t care, but have you seen how the other countries are treating it? Are you really saying PR, and the “Italian” team, the DR, and Mexico, and even Canada haven’t shown any emotion? Your comments make it seem like you’re not actually watching the games. That would put in the company of most American baseball fans, so I’m not saying you’re wrong about everything, I just don’t think the players are as apathetic as you claim. By whom? The Americans? Because the rest of the world (players and fans) seems to be taking them seriously.